‘Bounce TV’ Television Network Starts Today On A TV Near You!!! A new broadcast network is about to take over your TV Â they hope. Bounce TV is the name of the new 24-hour network co-founded by the son of late civil rights leader Dr. Martin Luther King, Jr. It’s set to debut at noon today in several markets around the country with an airing of the 1978 movie musical “The Wiz,” starring Michael Jackson and Diana Ross. Geared toward African-American audiences, Bounce aims to attract viewers with a mixed lineup of programs, old and new, inspirational stories, sports, documentaries and faith-based programs. Sidney Poitier’s “A Raisin In The Sun” and Spike Lee’s “Do The Right Thing” are also among the films scheduled to air during Bounce TV’s debut week. The network aims to capture a more mature demographic than the age group that tends to gravitate toward Black Entertainment Television which is now in its 31st year. Upon announcing the debut date for Bounce TV earlier this year, Martin Luther King the Third called the date an “important milestone,” noting Bounce’s status as the first-ever independently owned and operated TV network featuring African-Americans. Bounce will be made available to viewers who don’t have cable. Houston, Cleveland, Charlotte, North Carolina and Indianapolis are among the first cities that will have access to the network. Bounce will also air in Akron, Cincinnati and Dayton, Ohio; Hartford and New Haven, Connecticut; Norfolk and Richmond, Virginia; West Palm Beach, Florida; Birmingham, Alabama; Memphis; and Louisville, Kentucky. 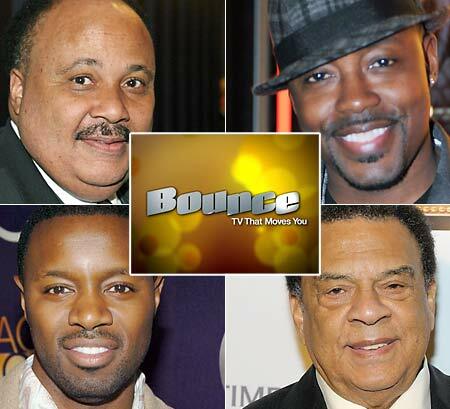 Bounce TVâ€™s founders include Martin Luther King III, Ambassador Andrew Young, Andrew â€œBoâ€ Young III, and Rob Hardy and Will Packer, co-founders of Rainforest Films, one of the top African American production companies in the world. All I am saying is can I get a show!!! Think Like a Man – #1 In the Box Office – The Numbers are IN!!! As long as it stays Black-owned, and not exploitative, or ignorant/simple-minded, I’M WATCHING. Any info on who exactly the co-owners are?